MEPs and civic groups gathered in the European Parliament on Tuesday (29 January) to promote an initiative for ‘Europe Day’ to become a public holiday across the bloc aimed at boosting European sentiment, with Maite Pagazaurtundua, a Spanish liberal MEP, saying it would “most probably be passed” in the February plenary session. Europe day (9 May) is currently not a public holiday across Europe, though employees of EU institutions have the day off. The initiative argues that making it a public holiday would help build a stronger European identity among citizens. “It seems there is clear support from several parliamentary groups such as the Greens, the Socialists and ALDE. Having 9 May as a public holiday is not for the sake of holidays but so that we can show our unity and fight for our values,” said Ivan Jakovčić, a Croatian liberal MEP, during the event. On 9 May 1950, French Foreign Minister Robert Schuman presented a declaration proposing the creation of a European Coal and Steel Community, the precursor of today’s EU. The initiative, originally promoted by the Spanish association Europeanists, is being led by several MEPs including Pagazaurtundua and Florent Marcellesi, a Spanish Green deputy. The EU assembly’s Constitutional Affairs committee has voted in favour of asking governments to agree to the proposal. 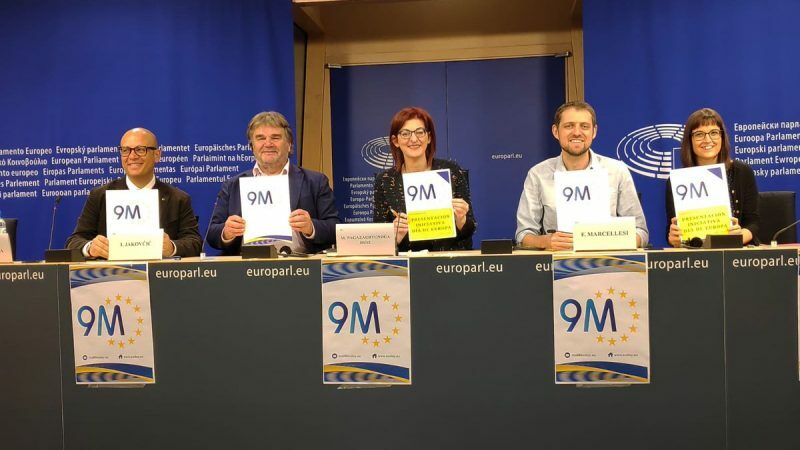 A group of supporters of the initiative, including José Francisco Sigüenza, president of Europeanists, and Simona Guerra, professor of political science at the University of Leicester, along with the two MEPs, presented the European Day manifesto to the press. “It’s not the institutions that create the EU, but the people who shape the institutions and the EU. The narrative has to shift from fear and negative feeling to a positive perspective: what kind of emotions can we share to build Europe?” asked Guerra. And let’s ask our EU- and national youth organizations to organize big music parades every year on Europe Day in the streets of all 28 EU capitals, starting on 9th May 2020, which is exactly 75 years after the end of WWII, to commemorate peace, freedom and prosperity, by celebrating a united Europe that is far away from nationalism, populism and antisemitism.